Miller Place High School seniors Joe Filippetti and Jillian Spreckels were recently recognized by the New York State Association for Health, Physical Education, Recreation and Dance (NYSAPHRED) as the top performers in the District’s physical education program. 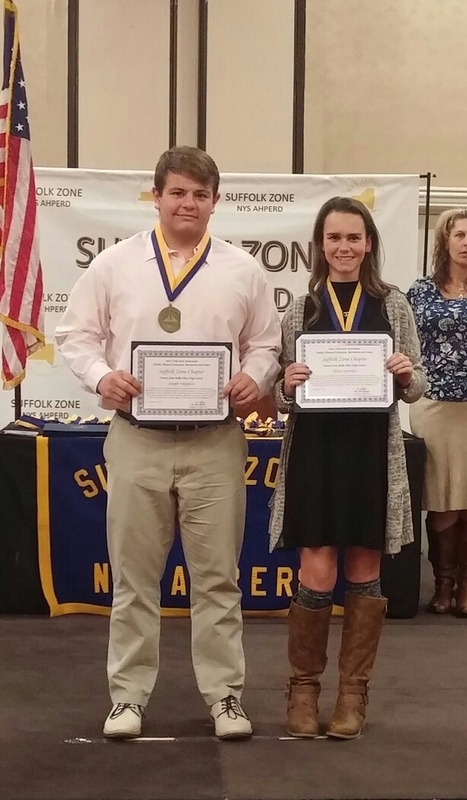 Both students were honored at the organization’s Suffolk County Zone awards banquet. During the banquet 114 students from 57 high schools throughout the county were honored. The students were chosen for their effort and compassion in physical education class, as well as their understanding of the role physical education programs play in building relationships and inspiring a life-long commitment to health. To qualify, students had to maintain an “A” average in physical education throughout their high school careers, have an overall grade point average of 3.0 on a 4.0 scale, demonstrate outstanding character and leadership and be a recognized role model for living a healthy lifestyle. The Miller Place School District has a robust physical education program, which reflects the emphasis the District places on the importance of living a healthy lifestyle. Miller Place High School Physical Education Teacher Mr. Tom Veryzer and Director of Physical Education for the Miller Place School District Ronald J. Petrie joined the students’ families in celebrating Filippetti’s and Spreckels accomplishment.